DEATH SCENE: Investigators process the area where a man was stabbed to death during a scuffle with a security guard at the Independence Square, Port of Spain branch of KFC yesterday. TWO hours after a security guard fatally stabbed a man outside the Independence Square, Port of Spain branch of KFC, he returned to the restaurant and surrendered to police who were at scene taking statements from people. The guard was taken into custody and handed over to members of the Homicide Bureau. According to reports, around 10 am yesterday 33-year-old Kareem Douglas of Charford Court, Charlotte Street, Port of Spain went to the restaurant with a camera and began taking photos. He was advised by the manager to desist from doing so since it was against management’s rules for members of the public to take photos inside the store. The man was escorted out of the restaurant by the security guard who advised him to leave the area. Douglas reportedly resisted and attacked the security guard with a knife. The guard was able to subdue Douglas, but during the struggle Douglas was dealt a fatal stab wound. He was taken to the Port of Spain General Hospital where he was declared dead. The guard reportedly fled the scene but returned shortly before midday and surrendered. Investigators are expected to view CCTV footage from the outlet and several eyewitnesses were also interviewed yesterday. One eyewitness told police Douglas appeared to be mentally unstable and spoke in a strange language when he was spoken to by the security guard. Another patron said he witnessed Douglas being spoken to but never expected the matter to escalate in such a manner which resulted in a person’s life being lost. Members of the Region 1 Homicide Bureau are continuing investigations. The outlet remained closed for several hours after the incident. 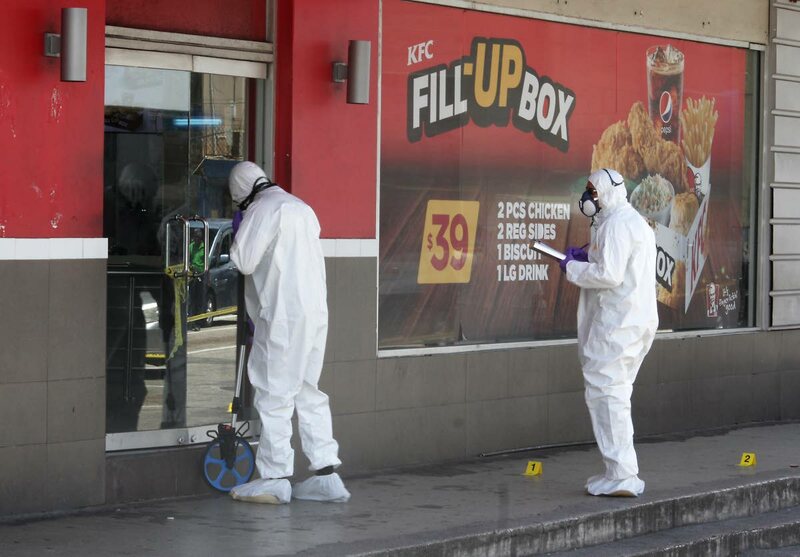 Reply to "Fatal stabbing at Port of Spain KFC, guard surrenders"